Enough of man bites dog! It's back to dog bites man. Enough of man bites dog! It’s back to dog bites man. 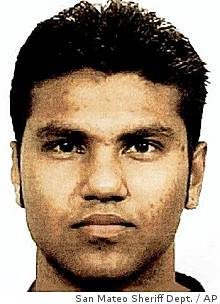 Right on the heels of the murder of black athlete Steve McNair by a “Caucasian” femme fatale, which you described as a “man bites dog” story, we get the news of one Mohammed H. Ali getting a new trial ordered by the awful Ninth U.S. Circuit Court of Appeals in the murder of football’s Hall of Fame wide receiver Fred Biletnikoff’s daughter Tracey. It’s like the natural (dis)order of the World has been reestablished after a five day summer hiatus. I am a true crime junkie and had never heard of this case. Tracey Biletnikoff’s killer is an immigrant from Fiji named Mohammed Haroon Ali whom she met in a drug treatment program and had a relationship with. The case features every element in the White Girl Murder Syndrome we have discussed at length. The 9th Circuit Court of Appeals is considered extreme even by most liberals. Ali, who had residences in South San Francisco and San Mateo, met Tracey Biletnikoff in 1997 at Project 90, a San Mateo drug and alcohol rehabilitation program where both were being treated. They started dating a year later while recovering from their addictions and helping younger patients in the program. According to trial testimony, Biletnikoff, 20, found out in February 1999 that Ali had relapsed into drug use and tried to get him back into treatment. They argued at the Project 90 office, where he was working, and he strangled her there with his hands and a T-shirt. Ali dumped Biletnikoff’s body near CaÃ±ada College in Redwood City and fled to Mexico in her car, authorities said. He was arrested coming back across the border. A defense lawyer said Ali was consumed by a violent craving for crack and other drugs when he killed Biletnikoff. I had initially posted Jack’s comment in the “Fatal face” thread but didn’t take in the full significance until David sent the article about the case. It was a great point by Jack.